Victoria County Master Gardener Association - 2018 Spring Plant SaleThanks to all who made VCMGA's plant sale a huge success. Thanks to all who made VCMGA's plant sale a huge success. 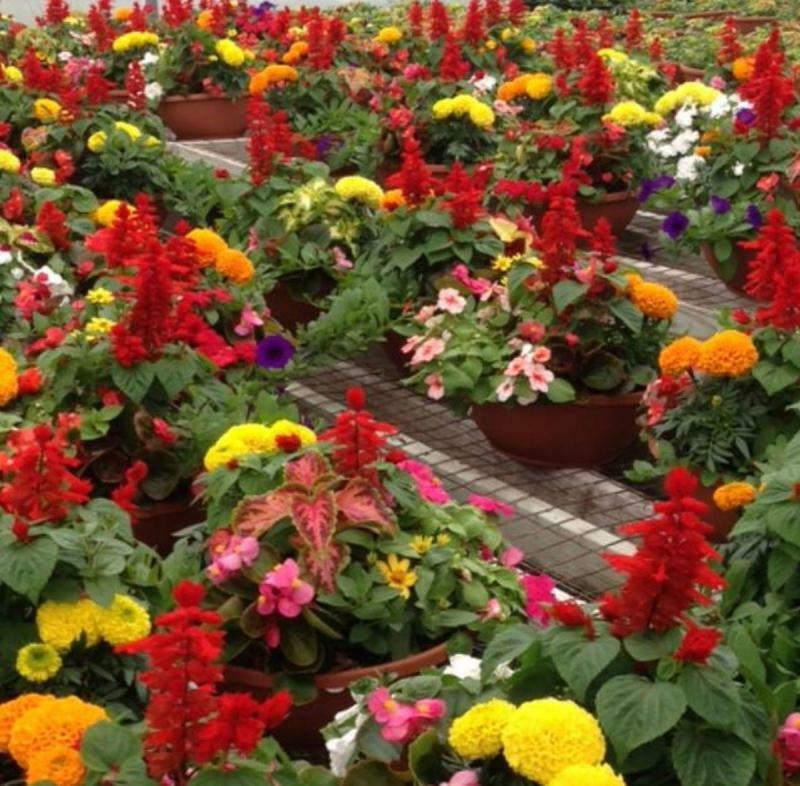 Spring color will greet Victoria gardeners at the VCMGA spring plant sale Saturday at 8 a.m. Delightful, assorted containers full of bright blooms and foliage will provide instant color for the porches, patios or landscapes. These could prove to be the perfect Easter gift and will likely sell out quickly. One of the many daylilies offered at the Victoria County Master Gardeners sale is Web of Intrigue, winner of the 2007 Award of Merit given by the American Hemerocallis Society, shown here in bloom at Victoria Educational Gardens next to the sale facility. 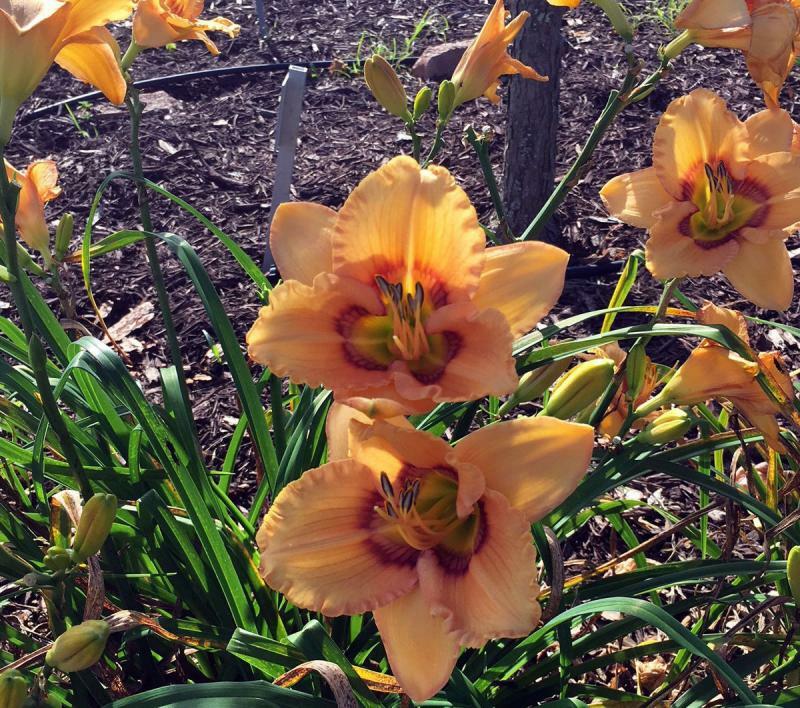 This beautiful daylily begins blooming in mid-April and wil have 30 to 35 flowers on each plant, followed by a heavy re-blooming period in July. Web of Intrigue is known to multiply rapidly, often doubling each year. 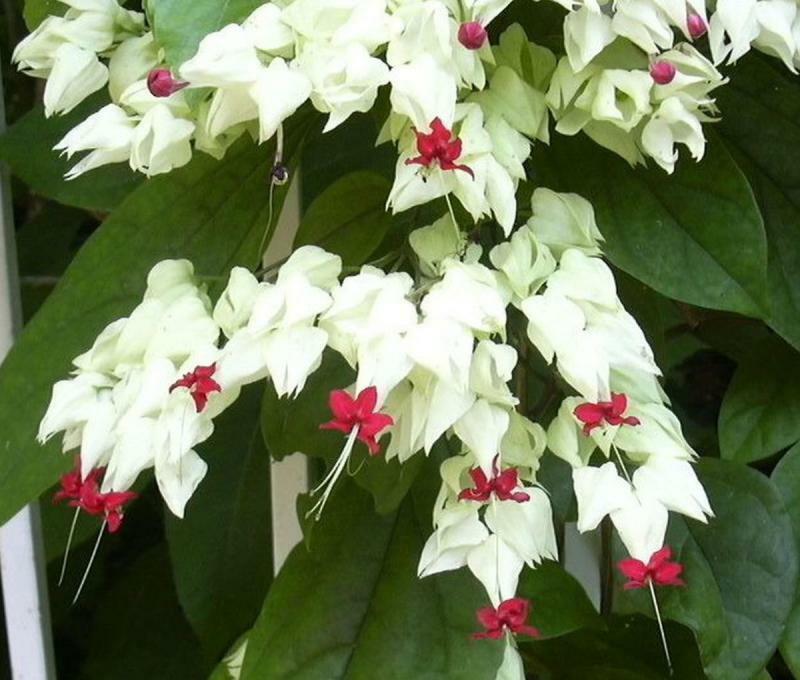 The Bleeding Heart Vine, a twining evergreen clerodendrum native to tropical western Africa, blooms white or pink calyx and red corolla flowers in clusters as shown here as early as June through October in this area. Look for it at the sale as its vine will explode into the sky around the time of the Fourth of July. It will sizzle out in cooler weather and die back in freezing temperatures but will come back the following spring. Various plants at the sale have been propagated and cared for in the Master Gardener greenhouse at Victoria Educational Gardens. 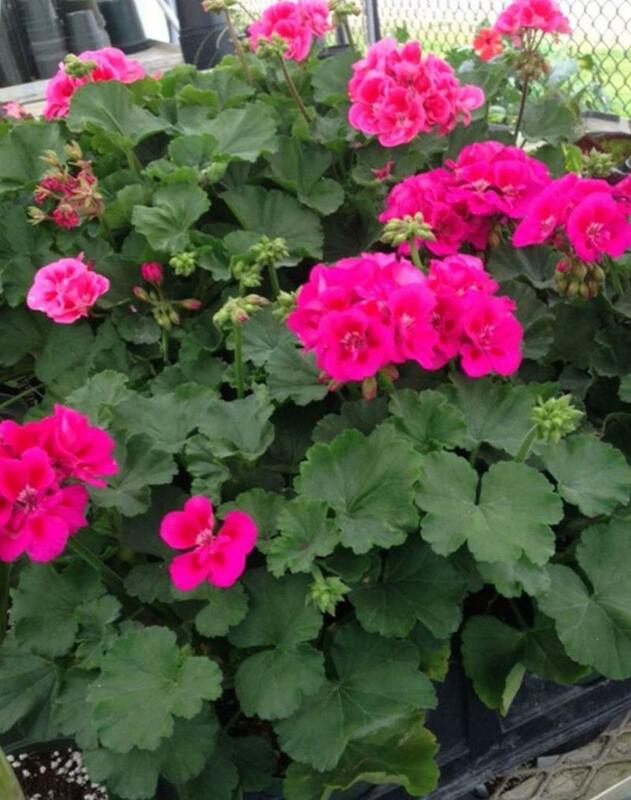 This Neon Rose Geranium is one that offers superb contrast with bright, pink blooms up against dark leaves. It is well suited for 5-inch or larger pots and in hanging baskets with sun exposure. Be sure to stroll on over to the gardens to see other ideas for your landscape. VEG is open dawn to dusk each day and admission is free. Like bees buzzing around spring flowers, the Victoria County Master Gardeners are excited to showcase beautiful, flowering plants in their spring plant sale Saturday from 8 a.m. until sold out. It will be held at the Pavilion, next to Victoria Educational Gardens, 333 Bachelor Drive, at Victoria Regional Airport. As mentioned in last week’s Gardeners’ Dirt column, this sale is an excellent opportunity to replace landscape trees and shrubs devastated by Hurricane Harvey. In addition to the wonderful citrus and fruit trees highlighted in that article, the sale will include shrubs such as the Canyon Creek abelia and Twist of Lime abelia. Canyon Creek has copper-tinged yellow foliage that deepens in the fall to bronze and rose. Twist of Lime, by contrast, has bright multicolored leaves ranging from yellow to ivory and green. Both varieties reward the gardener with pink flowers through the summer and fall. For both color and fragrance, look no further than the always pleasing Yesterday, Today and Tomorrow (Brunfelsia pauciflora). Flowers open as a deep purple (yesterday), then turn to lavender (today) and finally fade to a beautiful white (tomorrow). All colors will be present on the bush at the same time, making for a spectacular display. Two varieties will be available: the compact Eximia, which can grow 4 to 6 feet tall, and the larger floribunda variety, which can reach 5 to 10 feet. Orange Zest Cestrum, an essential plant in the butterfly garden, provides a showy contrast to Yesterday, Today and Tomorrow. Its fragrant, golden-yellow flowers bloom from spring to frost. If it’s colorful leaves you’re after, check out the deep burgundy leaves and red blooms of Cherry Blast loropetalum. This compact variety matures at 6 feet and is deer-resistant. This spring sale will feature a wide assortment of hibiscus varieties and sizes, many propagated in the Victoria County Master Gardeners’ own greenhouse. Colors range from white to yellow, from pink to red. Some varieties will boast variegated leaves, and others will have double flowers. To bring height to floral displays in the landscape, the spring sale will include several varieties of flowering vines that can grace an arbor or trellis. The bleeding heart glory bower boasts red and white flowers while the tangerine beauty cross vine sports reddish-orange blooms. Visitors to Victoria Educational Gardens in years past have frequently commented on the cheerful, yellow blooms and butterfly-shaped seed pods of the butterfly vine. The master gardeners are pleased to be able to offer a limited quantity of this vigorous climber. In addition to trees, shrubs, perennials and vines, the spring sale will feature many colorful annuals, ready for transplanting to the landscape or into containers. Back by popular demand will be the Texas Superstar favorite Whopper begonia. An assortment of geraniums, portulacas and lobelia round out the list of available flowering annuals. Daylilies have been called the perfect perennial. They are relatively easy to maintain, can provide weeks of enjoyable blooms and come in a vast array of colors and flower forms. Despite their wide adaptability, daylilies beyond a few mass-produced cultivars can be difficult to find in retail nurseries. This year’s spring sale will offer more than a dozen varieties of daylilies, including Web of Intrigue, Earnest Yearwood, Rhapsody in Time, Jester’s Robe and others. Daylily enthusiasts will enjoy being able to purchase locally grown, potted daylilies. To complete your shopping, look over the beautiful assortment of hanging baskets and colorful mixed containers. These baskets and containers offer the perfect spot of instant color to a porch or patio, just in time for Easter. They will remain in bloom for weeks and make excellent gifts. The spring sale is the first of two planned for this year. Proceeds from the sale fund many of the Master Gardener Association’s educational activities, including the incredibly beautiful and educational Victoria Educational Gardens. When you are at the sale, take time to stroll through the gardens and note the beautiful plants stirring back to life after a cold winter. Enjoy the vegetable plants popping up in the vegetable garden, the butterflies beginning to stir in the Butterfly Haven and the sound of water flowing over rocks in the koi pond. Spring is officially here – so be sure to come early. Each year, lines begin to form well before the doors open at 8 a.m., and many popular plants go quickly. From the master gardeners to you, happy spring; happy planting.